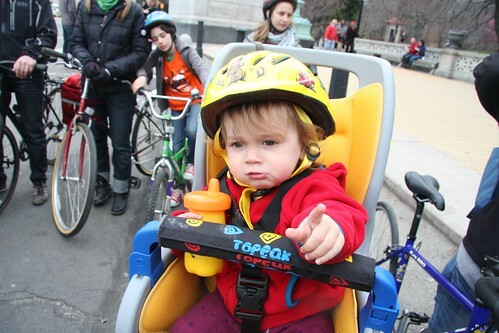 This is my daughter, cookie in her mouth and milk at the ready, telling me to go after seeing everyone start today’s We Ride the Lanes bike ride. Park Slope Patch estimated the attendance at about 750 people. If you took any pictures, please add them to the Prospect Park West Bike lane Flickr group. Full wrap up in this post.